Two University of Alberta professors are studying how saliva can be used to detect Alzheimer's disease. Researchers at the University of Alberta are testing how biomarkers in saliva could be used to detect Alzheimer’s disease. 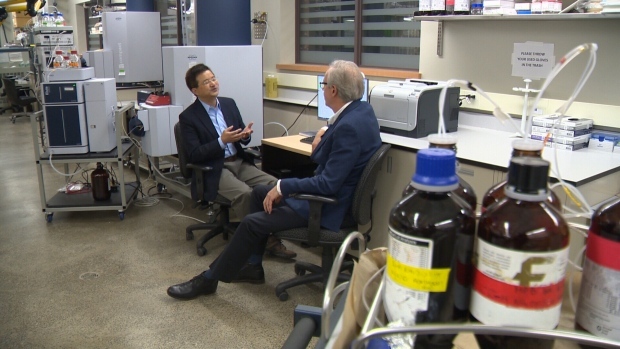 Liang Li and Roger Dixon, professors in the departments of chemistry and psychology, respectively, launched a study to find an inexpensive way of diagnosing mild cognitive impairment with metabolites. The team tested the saliva of individuals in three study groups—a control group, another considered pre-Alzheimer’s, and a third consisting of those with Alzheimer’s—to determine biomarkers for the disease. Li said their goal is to develop a diagnostic tool that can detect the early onset of Alzheimer’s, before the disease progresses to the point where it is untreatable. Or, he hopes, aid in the creation of medication. A saliva test, such as they’ve been studying, is also unobtrusive and easily collectible for patients. According to Li, the project’s next phase is to do a study with a larger pool. He hopes to validate their findings in three years.